Pork carnitas have long been on my "gotta blog" list and this past weekend I was given the perfect excuse to finally do it. Our church welcomed our new senior pastor and his lovely family to town and I had the privilege of serving them a meal as they started to move in. Now, before I get some reasonably predictable replies, I know that these aren't authentic carnitas, which are typically braised in boiling fat or lard. These are indeed braised long and slow, but in a rich liquid of chicken stock and enchilada sauce. I wanted to skirt the line between ease of preparation and authenticity. I was very happy with the results. Cut the pork into 2-inch cubes, removing any heavy fat. In a large mixing bowl, combine the marinade mixes, oil, vinegar, and paprika, and whisk to combine. Add the pork, toss to coat well, cover with plastic wrap and set aside for 30 minutes. In a large heavy pot (preferably an enameled cast iron dutch oven), combine the chicken stock, one can of the enchilada sauce, onion, garlic, and cilantro if you want it (I left it out because we're cilantro-senstive). Bring the liquid to a simmer over medium-high heat. Gently add the pork and the marinade to the simmering liquid, cover, and bring back to a light simmer. Reduce the heat to medium-low and let simmer until the pork is fork-tender, about three hours. Using a Chinese wire strainer or slotted spoon, remove the pork and onions to a large roasting pan. Spread the meat evenly throughout the pan, breaking the pieces of meat in half into smaller one-inch chunks. 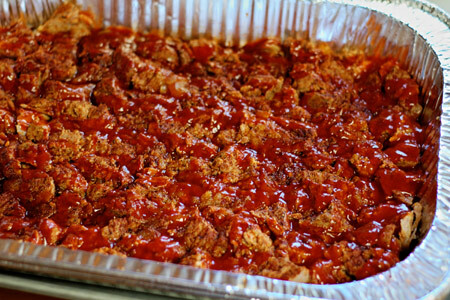 Drizzle the pork with the second can of enchilada sauce, and put it in your oven so that the the pork is about six inches from the broiler. Note: I used a disposable foil pan so for ease of clean-up for the family I was serving. Paying close attention, cook the pork under the broiler until the outside just starts to brown and crisp, about five minutes. 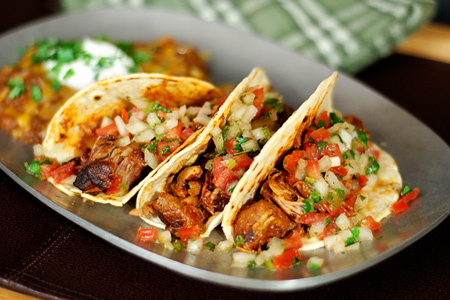 Serve with warm corn tortillas, fresh pico de gallo, and your favorite refried beans. I served my Funky Refried Beans. Great looking recipe. I added it to my favorites. Thanks for posting. Looks awesome! No comments from me on Lard... I have enough on my body to worry about cooking in it! LOL! We are expecting a gorgeous weekend here in Colorado and I'm making this! Thanks!!!!! How do you say "hungry"??? Even at 8 am? 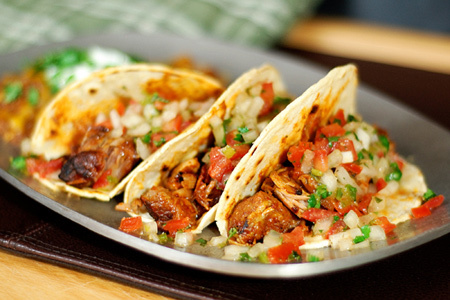 That's a mouthwatering carnitas. The recipes are all family favorite of ours. Thanks for sharing. These look really good and easy - I hope to try them out soon! Enjoyed Carnitas for the first time while living in Chicago, of all places. Had a few nice little spots that served them up. Great photos! Have to grab a napkin and wipe the drool off of my keyboard! I have made this two or three times. It's delicious and everyone always loves it. Making it for a birthday dinner tonight! Thanks for sharing! Thanks, Cynthia! I'm glad that you enjoy it.